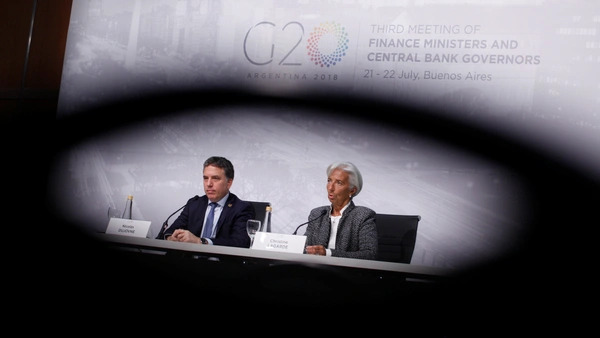 This weekend a beleaguered Argentina hosted the G-20 finance ministers to work out the agenda for their leaders’ December conclave in Buenos Aires. While officially focused on infrastructure and the future of work, these more technical discussions were overshadowed by U.S. tariff threats and President Donald Trump’s belligerence toward allies and the World Trade Organization. The U.S. attack on the global trading system comes as Latin America is finally embracing free trade. In a resurgence of market-friendly leaders, politicians from the left and right are seeking to expand their nations’ global commercial footprint through a flurry of free-trade and investment agreements. In normal times, they might have turned to the U.S., a top investor and trading partner for most every nation. Yet Trump’s obstinacy throughout the NAFTA negotiations suggests few deals are to be had to the north. As a result, a marked shift is now underway. The European Union (EU) has become a favored partner: Mexico advanced the renegotiation of its 2000 agreement in April, opening up the agricultural, services, and digital goods sectors, simplifying customs and harmonizing regulations to make it easier to sell across borders. Mercosur, the trading bloc founded by Brazil, Argentina, Uruguay, and Paraguay, is pushing to complete an EU agreement that has been marinating for almost two decades. Latin American free traders are also taking their cause to Asia. Mexico, Peru, and Chile were founding partners of the Trans-Pacific Partnership, now the Comprehensive and Progressive Agreement for Trans-Pacific Partnership after the U.S. withdrawal, and neighboring Colombia is among the nations clamoring to join. Mercosur is eyeing negotiations with South Korea, following a path laid out by Costa Rica, El Salvador, Honduras, Nicaragua, and Panama, which all signed bilateral deals this year. Panama has begun negotiations with China, while Colombia and Mercosur are flirting with the idea. And the South American trading bloc has started talks with Canada and reached out to New Zealand and Australia to gauge interest in boosting trade ties. The main Latin American economies are also moving to make real the long elusive dream of regional economic integration — in which it lags every region but Africa. This week, leaders of the Pacific Alliance, a comprehensive free-trade agreement begun by Mexico, Colombia, Peru, and Chile, will meet their Mercosur counterparts in Puerto Vallarta to discuss collaboration and even a potential merger. An agreement would bring together 80 percent of the region’s gross domestic product, creating a $4.3 trillion dollar market. While not as large a prize as the EU or China, this preferential agreement could be more important for Latin America’s future prosperity. Intra-regional trade and investment lean toward medium to higher technology sectors — including chemicals, cars, and pharmaceuticals — and higher value-added industries that bring in technology, enhance productivity, and create better jobs. If Latin American nations want to prosper from global supply chains, they must develop regional production to the point where they can compete with the integrated enterprises of Asia, Europe, and North America. Of course, Latin America’s current free-trade fervor could wane. After Argentine president Mauricio Macri plays host at the end of the year, the G-20 mantle will move on to Japan. Mexico’s president-elect Andres Manuel Lopez Obrador’s NAFTA-friendly comments sit uneasily with his more protectionist calls for self-sufficiency in food and energy. And in Brazil, the next president, who will take the helm in January, could reaffirm or discard the nation’s newfound trade enthusiasm. In that respect, the concrete results of the agreements now on the verge of completion will be critical. Yet even if there is an ebb and flow in sentiment, Latin America’s trade horizons have broadened. While geography remains in large part destiny, Latin America for now is moving on without the United States. After the NATO summit, Germany’s foreign minister proclaimed that the European Union can “no longer completely rely on the White House.” At least on trade, that lesson is one Latin America has already learned. Is Globalization Still Good for Health?